Updated 03-14-18. There's nothing like enjoying a bowl of pho at your favorite pho shop with your pho companions. But there are times, for various reasons, you'd like to make pho yourself at home. Most good pho recipes like Andrea Nguyen's or Didier Corlou's call for cooking the bone and meat in broth for up to 2.5 to 3 hours. Other recipes call for even longer simmering. Adding other preparation time, including the time to bring water to boil, drain and reboil, and you're looking at maybe 4-5 hours total cook time at least. 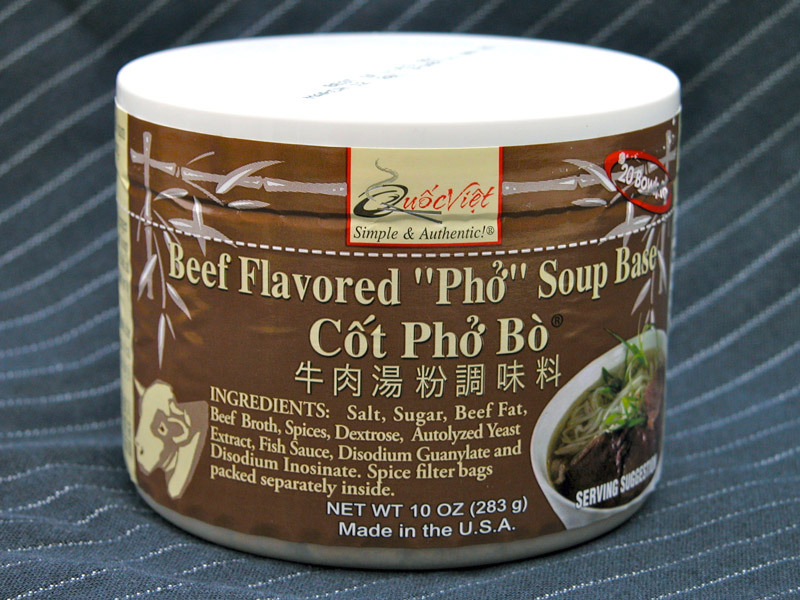 So for those who want to take a shortcut and shave off a few hours, try the Quoc Viet Foods Beef Flavored "Pho" Soup Base option. Full disclosure: I’m neither associated with Quoc Viet nor am I sponsored in any way by the company for any article on LovingPho.com. Quoc Viet Foods makes shelf storable soup bases, seasonings, coffee and tea. When it comes to authenticity, it's always a challenge to find ready-made food products, including Vietnamese pho. Yet Quoc Viet seems to achieve the impossible for pho, that is to "convert the traditional Vietnamese products into a convenient form" while maintaining the flavor expected of such product. This means for those who never made pho or tasted pho, they can now get very close to the real thing, easily. You can read more about my other post on Quoc Viet Foods. But enough about the company. Let's get to the goodness of their Beef Flavored "Pho" Soup Base. The package comes in a compact round plastic container. The wraparound label clearly describes the content and includes an ingredient list, nutrition information and cooking directions in English, Viet and Chinese. While the nutrition info states that there are 32 servings per container, the cooking directions indicate it makes 20 bowls. Confusing, but still very nice! At a price of US$ 6.99 per container, I'm paying US$ 0.35 for the broth in each of my pho bowls, excluding a few other ingredients of course. Inside the container are the powdered soup base with marrow, and 2 bags of spices. I should point out that the soup base itself is not loose powder as you may expect. Rather, because there is beef fat included (to give you the correct flavor), what you have is actually more like a grainy paste with a greasy consistency. But don't let my description scares you. This is normal and it is the good stuff. The soup base is the key part of the pho broth and is essentially your "instant" bone/bone marrow solution that you didn't have to cook for 2-3 hours. As already mentioned, it packs plenty of beef fats which you can skim off at serving time if you wish, but I wouldn't do that. It's the good stuff (I know, I already said this). The spice bags are your normal star anise, cinnamon, and various other spices. What's awesome about the soup base/spice bag combination is they give you all you need for the broth, including all seasonings that you need-I added some fish sauce but it's really not required. The only other things you'll need are the ginger and onion which should be charred or grilled before use in the broth, and the meat. Blanch meats for 15 minutes. Discard dirty water and rinse meats. (Step not in package direction): Char or grill the onion and ginger pieces. I cut my onion in half, but it’s your choice to do so or not. You can char over open flame or broil in your oven. It’s okay to char (let burned or blackened) the outside a little bit. Put meat pieces in a large pot and add enough water to cover them. Bring to boil then simmer at medium flame for 1 hour. Add onion, ginger about half way through. After about 1 hour, add spice bags and content of soup base. Important: Do not tear spice filter bags. After 15 minutes, remove spice bags. Continue simmer at medium flame until meats are softened. 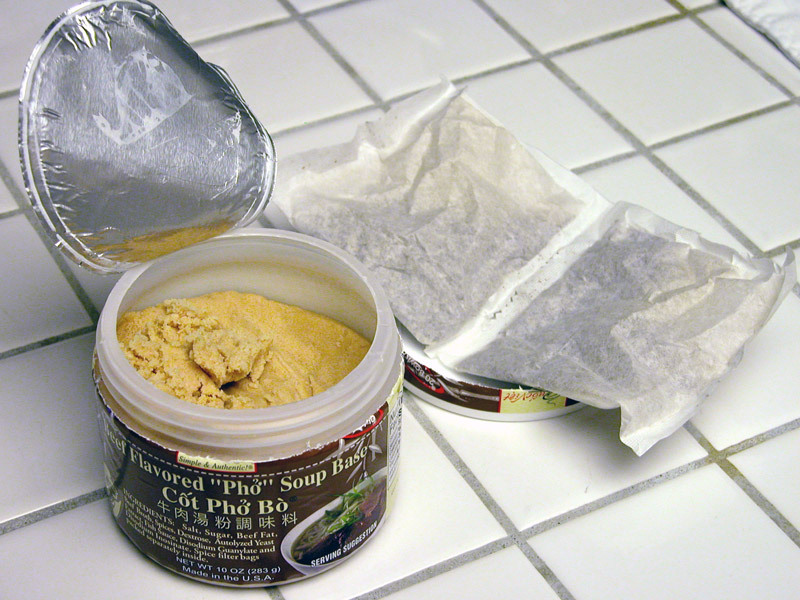 Note: you can leave spice bags in longer for more pho flavor, and remove when you think ready. Remove meats, onion and ginger pieces. Adjust water to 2 gallons or to taste. Also add fish sauce per your preference. Remember: start with small amount and add more as needed. Bring to boil and serve. NOTE: The above constitutes recipe for the broth only. To serve a complete pho meal, you’ll need to separately prepare other ingredients such as the banh pho noodle, chopped scallions and cilantro, etc. For me I ended up with so much broth that I had to divide into 3 smaller containers, put 2 in the freezer and enjoy the third portion over a few days. Again the key was the soup base which is all inclusive. There are no seasonings required as the soup base is super concentrated, and you can add water to adjust to taste. My total cooking time was about 3 hours, but that's just me because making and eating pho is a religion for me 😉 so I took my time. For others who just want to get quickly to a nice steaming bowl of pho with chopsticks and spoon in hands, you can probably do it in 1.5 hours or less. The determining factor will be how tender you want the cooked meat to be. Actually, the 3 hours that I spent to create the large volume of broth means that the next time I want to eat pho at home, I can have it as fast as I can prep the ingredients, cook the noodle, and re-thermalize (fancy word for reheat) the broth. Awesome! To speed up cooking time even more, an alternative is to cut smaller pieces of beef (hence cutting down cooking time further) and/or use pre-cooked meatballs instead. The latter option means that you wouldn't be cooking any meat in the broth at all, as you depend totally on the soup base for the flavors. By the way, for those unfamiliar with meatballs, you don't cook them in the broth for the whole duration. Just heat them in the broth just before serving. Total value (quality & affordability): 9/10. Unfortunately Quoc Viet is a wholesaler and does not sell directly to consumers over the Internet. The company is also very active at local demos, festivals, and charity fund drives, so if you're lucky you can catch them in action serving pho to hungry pho fans at these events. Thank You so much!!! ive been a huge fan of pho for a while and always found the process of making it for myself too overwhelming. This helped me out immensely! Should i cut up my ginger into pieces? Hi Joel: There are several ways to char the ginger. Some people will cut it in half length-wise to get more of its surface to char. Others char it whole. Still others peel its skin before charring. I would say take your pick, but personally I cut the ginger in half after peeling. This gives me better flavors due to larger charring surface. I’ve been an asian noodle fan since I was a kid and can’t get enough. I only go for the authentic stuff and find the stepped on versions a big disappointment. I’ve been looking for a good soup base and purchased this one a few months ago. After much research in making PHO the long way I have a couple of questions about this soup base. Should I use the whole container and and freeze the rest for later? How should I portion the container so I’m not wasting? Hi Orlando: Brian at Quoc Viet told me that the soup base is stable at room temperature for storage purpose. Even if you opened the container to use just a portion of the powder, the rest can be closed up and stored away in your pantry for months (I have to look at my notes to see if it was 9 months or something else that he said.) Of course you can throw it in your fridge too, no harm doing that. Hi SangHuynh: Can you provide a link to the YouTube page you mentioned? I’d like to check it out myself. With respect to the Quoc Viet soup base which is what this article is about, I think it does have large amount of sodium, as are many many other processed foods. If anyone has ever enjoyed restaurant foods, any restaurant foods, I think he/she should expect a large amount of sodium and/or MSG in the food as well. I do admit though, many of them are great tasting 😉 In all seriousness, I would say if you are allergic to MSG then preparing your own food is the best way to go. Here’s a post on MSG where a number of culinary professionals pitched in their own take on MSG, Vietnamese Pho With No Monosodium Glutamate (MSG)? Sure You Want It That Way? For me moderation is my rule for consuming MSG. Finally, you can also contact the product manufacturer directly. Hey all, I actually found this product at Amazon.com. 4 cans for $28.50 plus shipping. It took me all of 45 sec to order, I love Pho. I might look for it locally later, but after reading the article, wanted a quick way to get it. Hi Severus Snape: If I’m not mistaken, Quoc Viet products are not sold on Amazon.com. Maybe you’re thinking of something else? There is a competing product, but I do not have experience with it. Hello Cuong, I just double checked my invoice. I ordered through Amazon and it was Quoc Viet brand. The invoice was from Quoc Viet, not a retailer. They must be using Amazon to sell there product. Anyway I cooked my first batch last weekend, and it was great. Hi Severus Snape: that’s very interesting. My own source told me they don’t do that but maybe they do now. I can see it on amazon.com as a 4-pack. Good that Quoc Viet is branching out. In my opinion they are a little weak on the marketing side. I cannot reuse the spice bag huh? Hi Me: Sure you can reuse the spice bags but you’ll probably get nothing much out of it after the first use. It’s like your bag of tea, one time use is all you can get out of it. I prefer Pho Tai and don’t care for the flank/brisket. Would it be possible to skip adding the brisket to the base when cooking or would I lose out on a lot of flavor? The bones, brisket and flank are essential for the beef flavor in the broth. While Quoc Viet has done a great job saving you from having to cook the bones, brisket and flank are still require to give you the rich taste. Now you can substitute more flank or more brisket in place of the other, but I would not recommend foregoing them altogether. The base itself can only give you marginal broth quality, but you may still try the soup base by itself just to know. My guess is it may be better than many restaurant broths I’ve tasted, but really it’s half of what a real pho broth should be. Let us know what and how you did. I just tried the Quoc Viet base for the first time today. Not only did use beef chuck (couldn’t find brisket and flank at my local grocery store), I also bought a small amount of beef ribs to throw in the pot for extra depth of flavor. It came out GREAT! It was really good. I’m pretty particular about my pho. My mom’s pho was the best. It wasn’t like my mom’s but it certainly tasted homemade and was as authentic as can be. For those who want a little more star anise flavor (which I love in pho), you can also throw a little more into the pot. Hi Long: I’m glad you find it acceptable to your taste. Yeah I would say adding more of any kind of beef/beef bones should definitely help the flavor. And I agree, adding more star anise can really bring pho flavor out even more. I do this myself as well. The one thing that I found odd though was the fact that the Quoc Viet directions had you only use the spice packet for 15 minutes in the broth. I left it in there for about 25 minutes. And I found the broth when eating to be mild in pho aromas. I remember that my mom used to leave all the spices in the broth the entire time. So next time, I’m going to leave it in longer to see how it goes. Long: It may be odd or it may not. My take on this is QV is just practicing proper precaution, specifying what I would call a safe, reasonable amount of time. I agree with you in leaving the spices in there longer; I love my pho to be real fragrant with pho spices too. From a manufacturer’s point of view though, I can see that they know they do not have total control over what their customers do, so the safest is to recommend something “reasonable,” like 15 minutes. With QV products, they aim to serve those who may not have ever made pho themselves before. So new QV customers may not know how long to simmer spices, or they may leave them in too long resulting in a broth too pungent for average people. Anyway what they should do is suggest something like “vary amount of spice time to fit personal preferences.” If you like yours in there longer, I’d say go for it. What cut of beef and how much should I buy for use in the broth? Hi Joe: You want to use beef flank and/or brisket. Depending on where you live, you may not get the proper cut, but anything close should be fine. Vietnamese use untrimmed flank in pho, but you may find it difficult to get untrimmed flank in American supermarkets. I live in Toronto, Canada and I’ve managed to only find the cheap unsatisfying Pho soup powders.. Does anyone know where to buy these Quoc Viet products specifically in Toronto? I’m REALLY craving Pho Tai Chin Nam as we speak! Hi John: I am not sure if Quoc Viet is available in Toronto market. From what I know they do not do mail orders for retail sales. You may want to contact the company directly to find out where their products may be carried in your area. I know they may ship out products to retail customers from time to time. You can contact Alan Khoa Nguyen, Quoc Viet’s Sales at info@quocviet.com, I’m sure he can steer you in the right direction. Alternatively, you can try Quoc Viet’s Amazon storefront. Let us know how you fare. A man should not have to suffer just because he wants some decent Pho Tai Chin Nam. Joe: I think you can honestly use whatever beef cuts you like. Obviously, don’t waste your money on expensive cuts like filet mignon or rib-eye. If you don’t like gristle or fat, use leaner cuts. If you like all that stuff, use cheaper, fattier cuts. I’ve even used basic baby back beef ribs for the soup stock. And the meat came out delicious! So, I cut them off the bone and added it to my bowl of pho. I just purchased my first container and cannot wait to cook up my first pho effort! I’ve read all the comments here and have a couple of questions. Cuong how long do you leave the spice packet in for? I see Long says 25 minutes worked but maybe longer next time, do you or anyone else have a perfect time? Also, any tips on charring the onion and ginger? Do you do it stovetop or use a grill? I was advised to use beef knuckle to add depth to the broth along with the brisket and tendon, any thoughts on that? Thanks so much. Hi Blaine: For the spices, I left mine in for various amounts of time, depending on my mood 😉 Sometimes 15 minutes as stated in this article, other times longer if I want a little stronger fragrance. One time I got distracted and forgot it until about 50 minutes later. No big deal, just a little stronger spice taste, no one will know. Others above may have found their own preferences. So I don’t think there is a perfect time, because each individual is different. 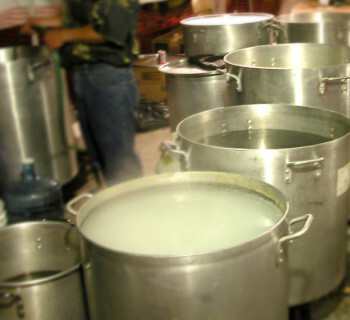 The restaurants cook for the mass so they have to choose one time (arbitrary but to their preference) so that the broth they serve stays consistent from one day to the next. At our Ui-Cha! Pho and Ca-Phe I think we use 45 minutes. Charring onions and ginger is pretty easy. Either stovetop or grill or any other open flame would work. Charring in an oven at high 450°F can also work. The main thing is high temperature, dry heat, and give it enough time to burn the sides and edges. Just be sure to wash them thoroughly first. You can cut them up so they have more charred surfaces which results in more of that burnt flavor, and/or smash or crush them before going into the broth to help with the extracting of the flavors. With respect to beef knuckle, yes that would be nice, or better yet if you can find ox tails, then that would be even better. The bones with marrow in it will give you great pho flavors, but then you’d be defeating the purpose of using the Quoc Viet soup base, because they have the marrow in there already. The idea is QV products save you time in cooking the bones. Good luck Blaine, hope this helps. Well I made it and it was pretty damn good! I would have to rate it almost as good as my favorite restaurant, but not as deep in flavor. I did leave the spice packet in for about 45 minutes and I used a combination of ox tails and beef short ribs in making the stock. I think next time I will add additional star anise. I definately give the brand a two thumbs up!! Blaine: congrats on getting what you like. Good choice on the ox tails, but I’ve never seen short ribs! BUt a little tweaks here and there will get you what you like, your own pho recipe so to speak. Hi! I’m making pho for the first time using this base and had a question. Can I just use one spice packet and half the base? If so how much water would I use? Also, it says to blanch the meat – in just water? Really I’m just concerned about how much water to add once I cover the meat – I’m using flank – and I don’t want to make it too watery. I’m cooking for 5 so I’m hoping to just use half and save some for the next time. Any more direction would be appreciated! Stephanie: Yes of course you can scale it any way you want. I think the instructions say the final quantity is about 2 gallons if you use the whole container, so if you use half container then your final stage should have water added to achieve 1 gallon total. When blanching the meat, just boil water and add your meat for 15 minutes as instructed. Some people feel that may be too long so they adjust down to 5-10 minutes. The idea is to wash off impurities outside the meat before you really simmer it for an hour or so to get the flavor out. I’d say flank would taste very nice. But why not just make the whole batch one time and put the unused broth in the freezer; pretty much standard practice to store any kind of broth or soup. The next time pho craving calls out for you, it’s just a matter of thawing and reheating. Good luck with it, but you really can’t go wrong. If you don’t like the way it tastes on first trial, I am sure your second one will be much much better as you know what to do and what to expect by then. @Jessica: One big difference about pho ga is the chicken/chicken bones are much faster to cook than the beef/beef bones. So your cooking time will be shortened considerably when you make pho ga. Another factor is you want to make sure your spices and seasonings are used properly/less in pho ga, otherwise you will mask out all the delicate chicken flavors that you have. Whichever pho you are making, the seasoning and spices should already have been adjusted for that particular pho type in the recipe you are using. If you put the recipe side by side, for example, you may notice that pho bo has more star anise, but less cardamom, or pho ga has cinnamon whereas many pho bo recipes do not call for it. I hope this helps, and you’ll do fine. Even if your first one does not turn out that great, your next one will be much much better. Not sure if everyone already knows this but the Quoc Viet 4 pack (2 beef and 2 chicken) is now carried at Costco. Best part, It’s only $16. @Quan: I’ve read about it but have never seen them at any Costco. I would expect Costco to carry them in certain markets only and not at all stores. In any case, care to share which Costco you saw them at? @scott: cooking the meats for an hour is definitely not long enough. You probably missed the step about simmering until meat is soft and tender, and meat flavor is extracted in the broth. This is why good pho broth takes time to make. Quoc viet soup base can help cut simmering the bones, but you still have to tenderize the meats. Can anyone tell me if this soup base has any clove in it? I do not like the flavor of clove in my pho and have had that in some restaurants. so the flank and/or brisket is to be sliced and served into the PHO broth when it comes time to serve ? Should it be cooled off first so it doesn’t crumble ? 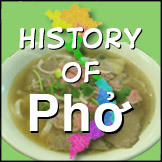 @Moonrock: By definition, pho is mostly served to a group even at home. Therefore the meat is normally sliced to serve many portions at the same time. The sequence traditionally follows the order of blanched banh pho into the bowl, then meat and chopped onion/cilantro, then the hot broth. Some people like to dip/soak the meat in hot broth first so they get their bowl hotter when the broth goes in; otherwise the broth would lose heat due to the cold meat in the bowl. I think your second question has to do with meat coming out of the broth at the end of the brewing cycle. If your meat crumbles then you probably overcooked it. In any case, wrapping it tight with food wrap will help when it comes time to slice it. Hope this helps. what if the spice bag is ripped open while cooking? Can you still eat the soup or should it be throw away? @LovePho: It may not be a total loss. Assuming the spice bag content is finely ground, powdery particles, what you may try is let the broth sit (maybe after done cooking) to allow everything to settle to the bottom as much as you can. Then pour the broth through a filter (as in large coffee filter paper.) This way you strain out as much of the rest of particles still floating around in the liquid as possible. After that, the broth may not look as good as it could be, but it will probably taste fine. Thanks a lot Cuong! I was afraid I might have to throw the whole pot out once the bag was broken! Thanks again! No problem @LovePho. Good luck. Hi, living along the shore in New Jersey the closest Pho shops are more than an hour away in Atlantic City so the fact I can purchase the products I need on Amazon (yes they have the Quo Viet products but it is not shipped direct from Amazon), or the VietnameseSupermarket (on-line) is great for me. I have eaten Pho in many good shops in Westminister thanks to my friend Alison a caterer from HB and a Pho pro. My question to you is, when ordering additional Pho noodles what size to your recommend for the Pho Bo moodle, small, medium or large? Thanks so much this thread has answered any question I had regarding the use of the Quo Viet packaged stocks. @Beachmaster: not sure if I get your question correctly, but normally if you order extra banh pho noodle in a restaurant, you’ll be served with whatever they serve in the bowl, most probably the small size noodle. Cuong, thanks for the response. What I meant was when I’m ordering the noodles on-line I’ve seen the banh pho packages listing small, medium and large size noodles. I just wondered which size would be best to use in concert with the Quo Viet stock. What would be the most traditional size? Thanks. @Beachmaster: most people prefer the small size (3mm) and many restaurants serve only the small size as fresh banh pho noodle comes only in the small size variety. It’s not a matter of which size would be best with Quoc Viet stock. It’s what works for you. It’s like asking “what size spaghetti is best with meatball marinara sauce.” I’d say go for the small size to try, you’ll like it. Thanks again Cuong for the respose, that’s exactly what my friends in Huntington Beach told me last night; the smaller width noodle was the best choice and what was used in the numerous Pho restaurants they had taken me too in and around Westminster. @Beachmaster: Glad you find your answer. FYI: For the northern style pho (phở Bắc), the wider 3mm banh pho noodle is actually used. So there is a difference of usage if you want to be more authentic about it. Enjoy your pho. Thanks Cuong for additional info. 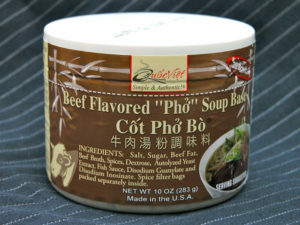 BTW, I just placed my order with Amazon for the Quoc Viet beef flavored pho soup base (4×10 oz. containers) and a triple pack of Three Ladies bahn pho noodles (3mm). I have Amazon Prime and these packages all qualified for free 2-day shipping. If it wasn’t for your web site and great threads I would still be in pho limbo here in NJ. I will let you know what I think as I’ll probably cook next weekend. Many thanks. @Beachmaster: Nice! go for it. But I thought you want the 1mm banh pho? Oh, and by the way Cuong, while my area is lacking for pho shops, we have some good ramen places close by and I make a pretty good ramen myself, using store bought noodles but a hearty homemade stock (slurp)! @Beachmaster: Somebody should consider open a pho shop in your area. Where are you located? If someone wants to, I can definitely help guide him/her through the process of opening and operating a pho restaurant. Cuong, I have given that much thought myself. I know it would do well here. I live on the New Jersey shore, Monmouth County to be exact, right by Asbury Park. As I said in an earlier post, the closest locations are in Atlantic City and Pleasantville, just outside Atlantic City. The demographic here is perfect and I’ve tried in vain to get my friends in California who eat pho weekly and are in the food business to come east and help me open one but they aren’t leaving the West Coast. Money is an issue as well. The least problem would be location. If I can ever find an investor I will let you know. Thanks for your kind. Most of the Asian restaurants around here are sushi, habichi, Asian fusion or Chinese American. 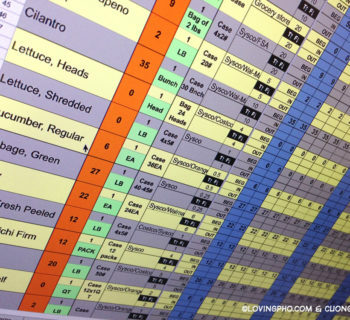 @Beachmaster: So you have friends in CA in the food business? Care to share what they do? Catering Cuong — parties, weddings, BBQ’s, funerals any type of event that could involve food. The business is based in Huntington Beach but some of the clients they have are in LA, a lot in Newport and all over Orange County. @Beachmaster: I see. Catering is a different beast altogether; much easier than running a restaurant in many ways. They would agree too, but they owned a restaurant first and got so many requests to do private parties etc., they sold the restaurant and went 100-percent catering. From my amature observations, serving food to the public in any capacity is not an easy task. @Beachmaster: Sure, and I can understand once they went the catering route and can make money from it, why go back to restaurants. Well Cuong, I made the pho using the Quo Viet product this weekend, followed all your instructions. I made the stock the night before. Started it about 6 pm and finished about 9 pm (I could have done it in about 2 hours but did it slow). I used a big piece of bottom round in the stock. Served it the next evening with the noodles, thin sliced filet of raw beef, basil, mint, sliced jalapenos, hoisin, hot sauce, bean sprouts, scallion and limes. Everyone flipped. It was awesome. The Quo Viet stock/seasoning packages are a winner in my book. Only change I will make next batch is going with the 3mm northern noodle as you suggested earlier. I just like a larger noodle. Also, as you said, using the entire container I was left with plenty of left over stock which we put in containers for use later this week. Thanks again. @Beachmaster: Congratulations!!! I’m proud of you. Keep in touch about opening a pho shop. I’m interested. Cuong, just wanted to let you know, the last time I made Pho was 03/15/14 and I had 2.5 quarts of broth leftover. I never froze the stock I just put it in plastic quart containers and kept it in the frige. This weekend I decided it was time for a second round of Pho using what broth I had leftover from three weeks ago. Happy to report the broth was just as good as the first time, perhaps even a bit more flavorful as it sat in the frige all that time. I did leave a thin layer of sediment in the containers and by doing so the broth was a dark, clear rich color. It was excellent. Made two full bowls of Pho and still had about a half-quart left. Quo Viet produces a great product. You guys are Extreme! And funny! Wow, what pho fans. Just so you know, you are missing the whole point of the convenience of Quoc Viet Foods soup base. I can make a bowl of pho in 10 minutes! Yes, it can be done. Boil hot water for 1 serving. Scoop in 1 table spoon of product. Done. Pour the soup in a bowl, add cooked noodles, add tiny slices of beef, add vegetables. Enjoy. You do not need to cook the entire container at one time. The product has a very long shelf life in the refrigerator after opening. BTW, I am QV owner’s sister.. The only reason that I am surfing the internet on the topic is because I just got home from Quoc Viet’s company party. They were celebrating their win in a Trademark infringement lawsuit against VV Foods, who is ran by my cousin, who stole my brother’s company idea. Federal court ruled in favor of Quoc Viet Foods! So celebrate on that the fake imitator/copycats will have to change their labels & not confuse consumers with subpar products & MGS ingredients! You order whatever noodle size that you like. I always like large because more surface to absorb the liquid flavor. Thanks for leaving your comment. I did congratulate your brother Tuan on the success of the trademark infringement lawsuit. I’ve acquainted with a few people there at Quoc Viet but I guess I never had a chance to meet you. What you said about the 10 minute pho is certainly correct. But this is true only if you want to have only bò tái (rare beef) and bò viên (beef balls) with your pho. If you want well-done flank or brisket then you must spend the time to make the broth in the proper way, because the meat has to be cooked and tenderized properly. This is why I wrote that Quoc Viet products enable consumers to shave off some cooking time but not totally eliminate it. If you read the Quoc Viet product cooking instructions and marketing materials, you will see that the company never advocates or even suggests the 10 minutes (or whatever short time) cooking benefits. Personally I think this is an oversight on Quoc Viet’s part to communicate its product’s benefits to both the Viet and non-Viet consumers. My guess is Tuan and the QV staff have their own reasons for not promoting such benefits but obviously I’m not privy to such decision. In any case, I don’t think it’s fair to the customers when you say they’re missing the point. You (Quoc Viet) never sells its products as such. A good analogy and lesson is the Arm and Hammer baking soda product. It started out as, guess what, baking soda, for baking! But along the way the company realized that the product has so many more side benefits such as its cleaning or odor-elimination power that they started to promote these as major benefits. I think QV should do the same and step up its marketing message. I’m sure this will help increase your sale. 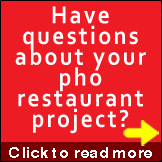 In my consulting work to pho restaurants, I find that there are tons of ways people are using QV products. Each restaurateur has his/her own reasons. A few do actually use QV products the way you suggested, but not all. A true sign of a good product is how many ways it can be used, and I still think QV soup base is a good product. Lastly, this may be considered a little bit nitpicking, but for the benefits of those who are not familiar, the proper way to plate up a bowl of pho is not add banh pho to the broth. It should be the other way around. The blanched banh pho goes in the bowl first, then protein ingredients and garnishes, then the hot broth is poured over last. This will ensure the best bowl of pho. Again thanks for stopping by Tracy. My name is Jenny and my father is one of the owners at VVFoods. I too, was surfing the internet and stumbled upon your comment. It’s a shame that you guys would wrongfully file a trademark claiming that the word “cot” was something your family came up with. The word “cot” does not belong to your family. It belongs to the ENTIRE Vietnamese community. For the last decade, my family (VVFoods) has done everything in our power to fight and stand up to what we believe is right. And after today, we stand tall and proud as ALL of those trademarks have been removed. Who is your father? Anh Quyet? Brian’s cousin? Or is your father Anh Quyet’s relative? Maybe you should sit down & have a serious conversation with your father to learn the truth behind how your father’s company got started. I was there, in the beginning, when Brian spent every weekend cooking pots & pots of pho, while Mr. Quyet came over for free lunch. Maybe he should have said, “Thank you for the free lunch.” Instead of taking advantage of Brian’s generosity & trust to steal his business ideas & cooking method secrets, only to pass it on to Mr. Quyet’s other relatives. As a disclaimer, I am not an employee of Quoc Viet & I do not represent them. I only speak for myself & personally, I think that my brother & his company were way too nice on your father’s company. If it were up to me, I would not sue you guys for the trademark “cot”, I would sue your company for the entire company & go after every penny of profit, along with punitive damages. Maybe you should go back & read the original trial transcript. Yes, a company with 13+ products line stole ideas from a company with 4 products line. And yes, how is it that the 4 labels are nearly identical to the other 13+ labels? Is there anything original about your father’s company? Really? Stealing all the way down to the label. Have they no shame? You are worry about public shaming on a website of what a readership of 1 million or so? Really? The only court that matters is the day when your father & company meet their maker. From what i heard, Quoc Viet is actually appealing the case and the appeals court will determine whether who is ultimately correct, the jury (who ruled in favor of Quoc Viet, finding that VV Foods infringed the Cot trademarks) or the judge (who overturned the jury’s verdict). However, the appeals court could also find the jury’s verdict was correct and decide to reverse the Judge’s order and require the jury’s original verdict to be followed. So the case is far from over and there is no “winner” yet…. @Duy: I’d appreciate if you provide sources or background info on what you just wrote, or maybe even identify yourself if you’re not just an interested (but very knowledgeable) member of the public. Your post has the type of information that not every layman off the street has access to or has good understanding of. You seem to know the process well. Are you associated with either companies or the case itself? First off I want to thank Tracy, Jenny, and Duy for leaving your comments. So far I haven’t joined in this topic regarding the VV Foods versus Quoc Viet court case, but I do keep an interested eye on this thread. At this time I just want to take this opportunity to clarify the following in hope that the discussion does not go where it shouldn’t. – In general, any self-promotion or self-advertising on lovingho.com will not be tolerated. As long as the discussion gives value to readers about pho or anything related to pho, then we’re all cool. – Healthy debates are always welcome as long as they 1) don’t get out of hand, 2) do stay civil, 3) do not stray too far into fantasy land, and 4) do provide reference sources to back up an important point being made. Personal opinions are ok as long as they are reasonable and do not cross a line, which I reserve the right to decide on but not have to tell anyone about it. We’ll know it when it does come. – Like Tracy alluded to in one of her posts, I was a bit surprised that the dispute was about the word “cot” and not about the product itself. From my own vantage point and understanding of the product line, I think it’s a lot more than just the word “cot”. But it’s possible that Quoc Viet did not have proper IP protection so this is the only possible way to take to court. – As long as the participants are willingly sharing their views on this subject publicly, I’d encourage you to at least provide some detail and back up info so that readers understand what’s going on. It seems Tracy did share some important background info, while Jenny is all about winning the case of the word “cot”, which I don’t really care much about, TBH. – @Jenny: I’d love to hear more about how your family worked so hard to bring the products to market. If you feel Tracy’s got the facts wrong then please provide the right facts or at least provide correction. For me, it’s not about winning or losing the case of the word “cot”. I’m more interested in how VV Foods developed its product line. If a VV Foods representative is open to an interview then I might even write a post or two about it. I wish all business disputes can be resolved peacefully and privately, especially between family members, and doubly especially between Viet family members. Unfortunately I also realize that this is not always possible. But as long as you’re willing to “talk” in a public forum and don’t mind being judged by the public, then let’s have the facts. Looks like that Quoc Viet Foods vs VV Foods case has been finally decided and Quoc Viet Foods won in the appeal. @Pham: You should read the editorial notes above. Rules 4) states that all discussions and debates are welcome if posters provide “reference sources to back up an important point being made”. The point you just made is “VV FOODS infringed by selling copy cat products which they stole from Quoc Viet”. Unless you provide proof or information to back up your claim, this discussion thread will end here. Trolling is not tolerated on Lovingpho.com. My opinion and comments come from me reading the press release and then reading the actual appeal court ruling that the press release referenced. The appeal court ruled that VV FOODS “intentionally copied Quoc Viets products and labels with the intent to decieve.” And they “reinstated” the jury verdict’s that found the COT mark a valid trademark and infringed by VV FOODS. @Pham: Regardless of what @Jenny said or how you feel about her comments, that was more than 2 years ago and she hasn’t made another comment since. Why suddenly jump on the thread as soon as a new verdict is out? The best thing is to let sleeping dogs lie. Personally I don’t have time to read court rulings, but from glancing through the new verdict plus from my understanding of this dispute from the beginning, it is a trademark dispute and not a product or product content dispute. I’ve clearly pointed this out in one of the posts above. Your statement “VV FOODS infringed by selling copy cat products which they stole from Quoc Viet” implies that VV Foods products are copies of QV products (using copied formulas or other protected trade secrets in product formulation and production). This is still baseless and requires proof. 2. I am not implying anything but just re-stating what the appeal court ruled. 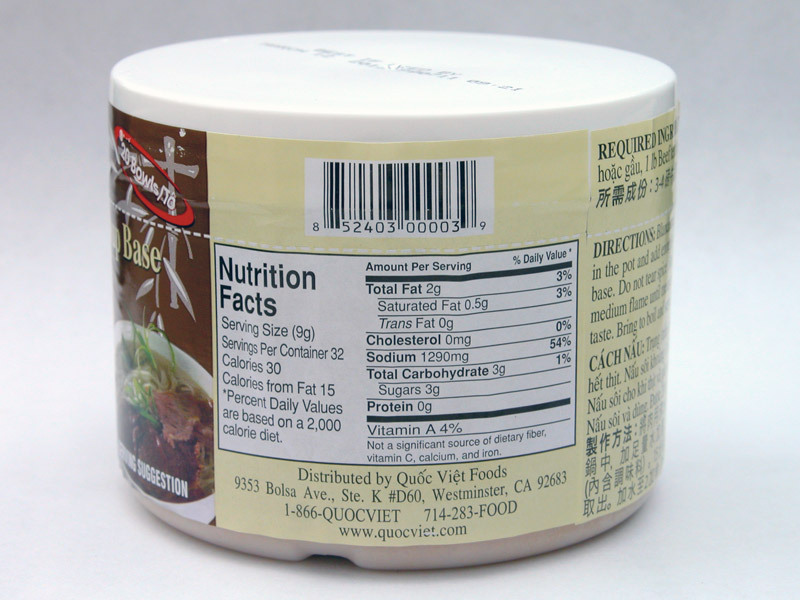 THEY said that VV FOODS intentionally copied Quoc Viet foods products and labels. Unlike other people, i dont care about people’s comments bc that’s just people’s opinions. But i do care about evidence and i think you should take the time to read a court’s ruling bc THEY set and decide the laws that we follow and ultimately decide what’s right or wrong under the law. Just like here, opinions or comments aside, its important (to me anyway) to find out that our court system has found VV FOODS copied Quoc Viet’s COT mark by intentionally copying the products and labels. What VV FOODS did is illegal and there’s no question on that anymore. 1. Thanks for updating the thread. I’ve been personally informed by QV’s attorney of this latest ruling, and it is my decision to not update or do anything about it at this time. If your aim is to update then it is appreciated and should have ended with your first post. If you’ve read the thread fully, then you’d have seen that I asked Jenny to back her story/claim with information and facts, and she went MIA. Enough said here. 2. Unless someone confirms to me (or I see it myself) that ALL VV Foods products ARE ACTUALLY PULLED from the market as a result of this ruling, this is again just a branding/labeling dispute. It’s good that justice is done about the trademarks for one party. However, VV Foods can just remove the word cốt from all their products and they should be fine to continue selling. And as such, it is a trademark issue and not a product copy issue. I’m open to be corrected on this. When Jenny said in her first post: “We will not be changing our labels after all” it was clear to me that this is just a labeling dispute. They would not be out of business if they don’t win. IF they lose then the only concern was that they have to change labels. It’s fine if you do care and take time to read court rulings, but I don’t read court rulings and a vast majority of people don’t either. This is a moot argument, and again you did inform with your first post and it should have ended there. If you do have things to contribute to subject of item 2. above then I’m open to it since it brings useful content for the readers/consumers. Further discussion on this subject without adding substantially new or useful information for lovingpho.com readers and meet lovingpho.com’s editorial focus will be strictly moderated. @Beachmaster: For me, 3 weeks may be a stretch to keep anything in the fridge then still eat it, except for some very good cheese that is 😉 Anyway, that’s awesome, the way your broth turns out in terms of color, taste, etc. That’s the way it should be, yeah! Just wondering: did you get a thin layer of white fat on top and did you keep it for reheating and eating? Beside the fact that that layer has a lot of flavor in itself, it is what keeps your flavors in the main broth, preventing the broth from reacting directly with the air and making it tasting bad, even when you have a cap or cover on. Thanks for checking in! Yes Cuong, there was the thin layer of fat and I did not skim it. I know that’s flavor. I too, thought three weeks without freezing could be a push but prior to making the pho I heated a small about in a cup, drank it and worked in my garden for three hours. No ill effects so I figured I’d run with it. However, the reason I didn’t freeze it was because I thought I’d use it sooner. Next time I’ll be more diligent with forward menu planning and if I know I won’t use it within 10-days I will freeze it. I just used the Quoc Viet pho soup base from Costco. I added 1 of the spice pouches and half the soup base to a big boiling pot of water with 1 lb beef shank w/ bone, 1 onion (cut in half), charred ginger strips and a handful of extra anise stars. Turned out terrific and the amount was enough for 4 medium size bowls. I had the butcher slice up my rare beef just the way I like it. I added the accompaniments: bean sprouts, basil, lots of lime, cilantro, green onions, sriracha, a little splash of fish sauce and a serrano chili for me. Took me 1.5 hours. Loved it!! @Dominique: Congrats on making pho on your own. With the exception of the shank with bone, which I don’t think did much for you in the amount of time you cooked, you can see how easy it is to start making your own pho. You may try without the bone next time, and your broth should be just as good, while the broth itself should be much clearer as well. Just my 2 cents. 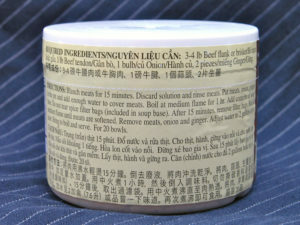 I just finished cooking your recipe using the Quoc Viet Soup Base. My soup came out to be a little on the oily side. Any idea why? Thank you in advance for the help! I’m thinking I need to blanch it more than once? I know when my mom cooks her Filipino beef soup dishes she blanches the meat 3 times. @Justin: The QV soup base does have oil in it out of the can/package. Whatever you use for beef (flank, brocket, etc.) will create additional fat in the broth. The layer of oil on top of the broth actually serves to preserve your broth; it prevents air from reacting with the broth and make it go bad faster. If you don’t like much fat in your pho, then you would just not ladle the fat into your bowl when serving; just leave it in the pot with the rest. I’d recommend leaving the layer of fat there and not throw it out. I’m not sure what you mean by blanching more than once. Do you mean blanching the pho noodle? Pho noodle should be blanched only once just before serving in the bowl. If you meant blanching the raw meat, then you shouldn’t have to do that. The thinly sliced eye round should cook plenty fast when boiling broth is poured over it. Hope this helps. Thanks so much for the speedy reply. We left it in the fridge over night and some fat formed on top of the soup. We removed the layer of fat and the soup is no longer overly oily. It is perfect now. Thank you so much for the recipe! How much of the powder do I use for one spice pack? I’m so confused. Hi Francine: Assuming by “powder” you mean the soup base which is more like a coarse paste, you should be able to scale the soup base with the spice pack. I think there are 2 spice packs in one container, so it’s one spice bag for each half of soup base. If you use the whole container at once then you use both spice bags. The way they packaged the container, you have to either use the whole container at once with both spice bags, or half the container with one spice bag, saving the other half and other spice bag for a future batch. Obviously if you want to use 1/3 of the soup base, then you have to use one spice bag because you should not break open a bag. The spice particles in there will dirty up your broth. Once you’re used to this, how much spice you use depends on your own personal taste. The way to adjust how much spice is in the broth is by either quantity (a bag or 2 bags) and the timing (the longer cook time of the spices, the more pungent the pho broth will become). Hope this is not too confusing. Glad to help out Francine. If the first batch does not quite meet your expectation (but I must tell you, it’s very hard to mess this up), then your next batch will be much better after you get a feel for it. Good luck. Hi Cuong, love your website. This is a true place for the elite pho eaters. I’ve always ate pho in restaurants but have been experimenting on the best method for cooking quality pho with consistency at home. So far, its been good but not as I’d prefer it to be. With regards to spices, I’ve had a few recommendations from people that cooks pho, some are restaurant owners as well. The recommendations from these people range from putting the spices in the broth for 15 minutes to to 1 hour. I find that with 15 minutes it is impossible for me to accept the fragrant of the broth. I’ve tried 45 minutes and it was acceptable. I wanted to leave it in longer to extract more fragrant but I was afraid it might give it too much of a kick that the taste may turn out tangy. My question is then, should we double or triple the amount of spice and remove it sooner to give it a good kick without the tangy taste? For example if I use little amount of spice, I’ll just leave it in there much longer, lets say maybe 2 hours or more. Or is the amount of spice not as important as to the amount of time its in the broth? @Steven: Great question. Spices for pho are critical ingredients that can make or break your pho pot. In general, yes it makes sense that the longer you cook the spices, the more you get out of it. And conversely, the quicker you cook them, the less flavor and fragrance you will get. The trade-off is just as you described: time versus quantity. But there’s also another dimension: method of preparation. But first let’s look at an analogy. Think of cooking your spices like steeping your coffee grounds in a French press. The reason why it is not recommended to go past 4 minutes in the French press is because the resulting coffee will taste bitter with longer time. Four minutes would be just right for coffee in the French press. So in a similar way, after being cooked too long in the broth, I would expect that you would not get much more out of the spices, plus they may even give you undesirable tastes. 4. Grind and roast them before going in the broth (also in a bag). The grinding releases fragrance of the spices and gives you more surface areas of spice to cook in the broth. The roasting action by itself also releases the fragrance of the spice as you heat it up. So as you can see, combining grinding and roasting in option 4 above will give you a very strong and quick kick of spice flavors at the shortest time possible. So with all that said, and taking into account all other variables, I’d recommend you test to see what works for you. If you decide to use option 4, I would say 30-45 minutes should be a good start, without knowing your pot size and other variables. Sorry for the long answer, but I hope this helps. Anh Cuong, thanks for the detailed answer. That was a lot of pho wisdom. I might give the 4th option a try. The previous trials, I only roasted the spices as most recipe suggested. The problem that I have is that my mom complains that the broth I make is too dark or too brown. And yes, I did washed and boiled the bones for 10 minutes and got rid of the first water as there are a lot of impurities that gets released from simmering the bones. I then washed the bones again before adding it to the main pot with filtered water in it. As it simmers for the few hours, I do scoop the gunks that float to the top. Yet the broth isn’t as clear as my mom would like. I told my mom that the pho she eats at restaurant with the clear broth is all msg and a lot of artificial flavorings. But she didn’t buy that. Is it because one of the spice causes the broth to become brownish? I checked my local supermarket and it has a variety of pho spices prepacked in a bag. Some have 6 spices while others have only 3 kinds. I used the one with all the pho spices with cinnamon, cloves, fennel, coriander, star anise, and cardamon. It comes with a small pouch to easily remove the spices afterwards too. Are all of these spices essential for the broth? I was hoping to dismiss the one that may have cause the broth to turn dark brown. I have heard from someone that having too much of a certain spice for too long causes the broth to darken. I just forgot which one. @Steven: If your broth turned out too dark or brown, then I wouldn’t say it’s necessarily due to the bone or meat, unless you still had a lot of blood coming off of them during simmering, and your simmering is too close to boiling. If you didn’t simmer correctly, meaning with only nice and gentle boiling action in the water, then you will get a lot more impurities coming off, but then it would make your broth more murky and not necessarily dark in color. Also it helps if you skim the scums regularly, preferably as they are formed and not letting them float around for too long. A lot of TLC you know? I don’t think the spices alone would get your broth dark brown, again unless you leave them in for too long. But then again how dark can it get with such small amount of spices? You mentioned you left the spices for an hour, which may be too long for a small pot/quantity of broth. I’m still not sure what quantity we’re discussing here so I can’t be sure what else to point out for you. How many quarts are we talking about here? Anyway I have to side with your mom on this. I wouldn’t buy any of your explanations ;P But I need more info before being to say something more specific to your case. Otherwise I can only give you general guidelines. The number and type of spices you use may be irrelevant to the resulting broth color, to a certain extent. You may want to test this yourself by light boiling some spices in water and see what color they contribute to your clear water, then decide. I’ve done some of this myself and it shouldn’t cause any concern. Remember, don’t argue with your mom lol. Anh Coung, deep inside I don’t want to argue with my mom that’s why I have to secretly seek advice from a pho expert LOL. As for my pot size, I have a 23 qt pot. It’s big but not gigantic like those at the restaurant. However, the water gets filled up to only 2/3 of the pot, that’s with the bones and stuff in there. For my first time, I used about 4 lbs of bones with 1 prepacked spice bag. Okay, I’ll admit I cheated the first time but it didn’t help. The pho flavor wasn’t strong enough so I added the instant pho flavoring from a jar. I was skeptical because its product of Thailand. So I’m sure it contributed to the dark cloudy broth. It was good but the color wasn’t too appealing. It was more of a Thai boat noodle, which happens to be my favorite as well so I didn’t mind. Since my mom and her friends love tripes, I went ahead and bought it home so they can add it in my creative recipe lol. And they loved it. I don’t like tripes so I added beef balls with my rare steak. To my astonishment, we finish the whole pot and it was my first pot of pho ever. With a bit of experience from the first time, I doubled the amount of bones to about 8 lbs and used 2 bags of prepacked spices for my 2nd attempt. It was much more flavorful without the broth being dark but brown, similar to the color of the oil in your car. I’ve had pho at restaurants where the soup is as clear as the hu tieu broth but with strong, beefy, pho flavor. Its mind boggling to me as to how it’s possible. A possibility that you mention was probably because there is a lot of blood coming off the bones/oxtails which I don’t think is an issue for me because I washed them with salt, then simmer them for about 10 minutes, and then thoroughly washed them again before tossing them into the main pot. But you’re right; maybe I should try to put the spices in the water alone for a while to see if there are any changes to the color. I’ll be sure to try this the next time I make pho, which should be real soon. Regardless if the water turns brown or not, I’m keeping the water after I remove the spices and just toss in the bones for it to simmer. And if I feel the broth still isn’t having a good kick to it, I’m going to add another packet of spice and leave in there for another 20-30 minutes. Additional information, I do char the ginger and onions and got rid of the black charred around it before tossing it in the pot. I also use cheesecloth to filter the broth after its done cooking so it’s a clean broth without any unwanted stuff floating around. If you have any suggestions or recommendations before my next trial, please provide them and I will update with my results. Thank you! I noticed that you stated that you use “product of Thailand”. Try Quoc Viet Foods products. It is made from real bones vs. artificial flavorings & MSG. See if that helps with the clear broth. Good luck. – The spice in water test should be just that, testing some spices in boiling water in a small sauce pan just so you see what color you get. This is for your own understanding of how these ingredients behave and how they affect the liquid color. I wouldn’t just continue to make your pho from this. Instead of using pre-made bags, you may consider buying your own spices and mix them yourself. This way you know exactly what you use. – 23 quart pot is not very large, especially with bones and other things in there, but it should be fine for home cooking. Just be aware that, for such small pot, any change you make may become more magnified and exaggerated than you may intend to. – The instant flavoring may have contributed to your color, but without knowing what it is, it’s hard to say. – Regarding the bones, if you haven’t done so, I suggest you have them cut into 2 inch long pieces. This will expose more marrow for more flavor quicker. 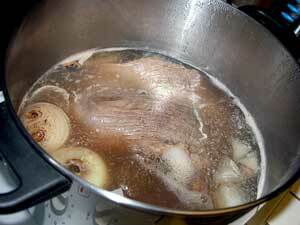 – During blanching, I would not just simmer the bones and the meat (like flank and/or brisket, if you use any). I would boil it at the highest boil you can for 5-10 minutes, then discard the water and wash the bones and meat. This is the time to get all the dirty stuff out of both the bones and the meat, and this is the way to do it. Otherwise, you’re not getting much junk off at slow simmering. – For the charred ginger and onions, it’s not necessary to clean off the black/burned stuff. The black stuff actually contributes to your broth’s flavor, and they don’t add much color if at all. You said you filter the broth afterward so that is perfectly fine. The bottom line is to have fun finding what you want, but you want to do it with the proper knowledge in order to say on track. I hope these tips help. Happy hunting. Thanks for the advice! I’ll try it again this time with your suggestions. Until then, I have to finish the big pot of hu tieu in my kitchen. Let me know how it goes the next time you try it again @Steven. Looks like you’re very busy cooking good stuff in your kitchen there. Its look like a duck, walk like a duck, quack like a duck, it is a duck! There are many companies out there making much better tasting products than this company with better flavors. Someone commented in amazon this product smell like fish food. Also I heard this company put dead people bone in their soup base. No lie. do your research. @Ramen King: no lie, and also no links or references? It would be helpful to share the sources where you got your info from. If you spent the time to make a serious point, then you might as well spend some extra seconds to share some back up references. If you know of better products then by all means please share. Dead people’s bones? Are you still living some place where baseless stupid rumors are still taken seriously? Or maybe you’re associated with people who lost the lawsuit to Quoc Viet a few months back? I get no benefit from Quoc Viet, but I’m just saying. I’ll leave this comment on here so readers can make their own conclusion about your contribution. Any future comment of the same nature will be taken down. And thanks for visiting Lovingpho.com. anh cuong – we LOVE your amazing PHO wisdom and knowledge! I will use QV’s beef base tomorrow. 1) do you recommend adding fish sauce and rock sugar at the end? 2) I made QV’s chicken pho with coconut sugar. Would coconut sugar be okay substitute for rock sugar in the beef base? 3)what containers do you freeze leftover broth in? do you also freeze the meat, too? 4) 10 Quarts is enough for 4 people or 20? I was confused on that. 1. By default, Quoc Viet soup base should already contain fish sauce and amounts of sugar they determine to be “typical” for pho. As you should always adjust to taste at the end of any cooking, I’d recommend trying without adding extra fish sauce and sugar, and adjust at the end. 2. I’m not familiar with coconut sugar. Some people say it tastes like brown sugar but I’m not sure if that’s accurate. If coconut sugar is acceptable to you in chicken pho, then I don’t see why you can’t use it in beef pho. For me, I’d make sure it does not add any “strange” aftertaste or flavor. 3. You should be able to use any container that’s freezer-safe. Most freezer-safe plastic containers do say so on the outside. You can also use freezer-safe zip-lock bags. Obviously you don’t want to use glass products. If you use metal products then it will deform as the liquid expands while it freezes. There are many other tricks and suggestions for freezing liquids in home use. I’ll just share one with you here: the flatter and smaller portions you freeze your liquid, the faster you can safely defrost it. With respect to the meat, I assume you mean the cooked meat and not the uncooked one. But either way, yes you can freeze meat too. 4. For home cooked pho, the portion size depends on the size of the bowl you use. For a 10-quart yield, or 320 fl-oz., if you use 32 fl-oz of broth per bowl (this is huge bowl typically used in restaurants) then you’d get 10 bowls. If your bowls are smaller then you’d get more bowls out of it obviously. It depends on your situation. If you say 1 tub of base is enough for 10 servings for you, then that’s fine. Though it still says nothing about your yield (how much final liquid you actually got after final adjustments when all cooking was done) and your bowl size. By the way, in my personal opinion, Quoc Viet can do a better job on marketing and distributing their products. so I made QV’s beef pho, using rock sugar I found at the Vietnamese store here. it took me 3 hours. it just didn’t taste good to me. we’ve never had issues with the chicken base (no MSG headaches, metallic taste, bloatedness) … but sadly, all 4 of us didn’t feel well afterwards … and the broth was not as tasty. I do have a jar of the bun bo hue base … if you or any readers have advice on using that base, please chime in!!! also, I emailed QV, and they said they will soon have distributors in Australia … YAY !!! I’m sorry to hear your first beef pho was not good and you didn’t feel well afterward. In my experience I don’t expect anyone to make good beef pho the first time, or even the second time. I don’t know what kind of beef you used and how you prepared and cooked it. For a lot of people it takes practice to get the broth right and the meat tenderized correctly, as they learn to make adjustments with each successive pot. I was recently at our local Oriental grocery store and came across these products on a shelf. I’ve only had pho a handful of times and have loved it. We have California Pho (a franchise, I believe) here and Honestly I have no idea how authentic it is or if it is actually ‘good’ pho…..but I have really enjoyed it every time! I bought the beef flavor and was excited but nervous to use it and was so happy to come across this blog prior to actually making it! I think I ended up reading the whole comment thread. Even though the recipe is on the container, I found this and many of the comments very helpful in making a successful….pho tai chin? I think? I made my pho with brisket and thinly sliced sirloin….my fiance was super confused when I put slices of raw beef in the bowl prior to adding the hot broth but once it cooked before his eyes he understood! I’m not a fan of sprouts but am trying to incorporate a lot of veggies in my meals, so even though it may not be proper, I added thinly sliced pepper rings and baby bok choy to my bowl. I’d say it turned out comparable to what I’ve had at the pho restaurant nearby. Hi Brittany: Wow success the first time out! Congrats! This is the exact reason why I wrote posts like this one. I always maintain that if one pays attention to details, and has a real desire to do it, then he/she can make at least a decent pot of pho to enjoy at home. Then it will only get better from there. And Quoc Viet helps make it easier to start out. Thanks for sharing! There you go Brittany. You’re a clear proof of what I’ve been preaching: anyone can make pho at home, and for those with cooking experience or who love cooking, the experience is over the top. There’s nothing like eating a delicious bowl of pho AND knowing exactly how it was made AND what went into it AND how you may make it even better next time. Bonus: If you’ve made a decent size batch and stored/froze it away, then you can have pho any time over the next days and weeks without really paying for it. That, for me, is just icing on the cake (just to stick with the food theme). LOL. Because I live 100 miles from the nearest Vietnamese restaurant, I’ve learned to make pho myself, and I use the QV soup base exclusively. The big key is to make sure you rise your bones and beef and rinse the pot out before after boiling, and starting with fresh water to get that nice clear broth. I’ve also read that it’s best to use the beef “knuckle” bones, but I can’t find them in my area. Instead I use the traditional beef shank-type bones and dig the marrow out of them. This also helps to keep the broth clear. Thai basil grows beautifully in my area of northern Michigan and it’s a really nice extra treat when I can have that fresh in my pho! Thanks for such a nice blog. I’ve enjoyed reading this! Hi Julie: The soup base itself does have marrow flavors cooked in so that people don’t have to use bones and save time in the process. If you’re adding bones then I’d assume you want a lot more beefy taste. But then if you remove the marrow before cooking then you’re not getting the real “pho” flavor. Also, you didn’t say how long you simmer the bones, but if you’re not cooking them long enough then using bones at all is kind of a moot point regardless of whether you dig out the marrow. Even at an hour of cooking you’re probably not getting much flavors out of any beef bones. So I’m curious why you use QV pho soup base AND adding bones too, and how long you keep the bones simmering. In the end I’m glad you find ways that work for you. By the way, growing your own Thai basil is great but northern MI is not too forgiving in the cold months. There are things that can only exist in the warmer climate. I ran a pho restaurant in Missoula MT and it was pretty rough to even acquire it from out of state. I use the base because, well, I’m still intimidated about toasting the appropriate spices! I use the bones because I think it adds a beefier flavor than just the base alone. I also char my ginger and onion. Here’s the website I’d read about removing the marrow from to make a clearer broth, thus, my rationale. https://steamykitchen.com/271-vietnamese-pho-recipe.html I simmer the bones about three hours. I can only grow Thai basil in the summer months. Incredibly, in my sandy Lake Michigan soil, it grows really well. Better than Italian basil! I end up just settling for other herbs in the winter. Thanks for clarifying Julie. I understand what you’re doing now. Personally I think you’re overdoing it, but this is not necessarily a bad thing. Allow me to explain with a few additional clarifications and tips. Firstly, it’s apparent that you are mixing 2 different recipes together. One is the QV Pho Soup Base as described on its label and expanded further in this post, the other is Jaden Hair’s recipe from steamykitchen.com, which is the recipe you referenced in your previous reply. Normally people use one recipe or the other, and only mix up elements from different recipes when they’re not happy with what they got and know how to make adjustments to create something new. Jaden’s recipe is a standalone pho recipe that does not need any other enhancement. It is making pho from scratch and it is a solid recipe listed as one of my recommended pho recipes (https://www.lovingpho.com/pho-chefs-recipes/top-pho-recipes/). On the other hand QV’s recipe is printed on its label. The key reason for QV Pho Soup Base to exist is to allow people to skip the long simmering time of the bone and marrow (as called for in recipes like Jaden’s), and still get the right bone and marrow taste in pho. This is helpful especially for those who’ve never made pho before or don’t want to spend the time simmering bones. A secondary utility of QV Soup Base is to be used to help enhance another recipe. So most people use either a standalone recipe (Jaden’s or any other) or the QV Pho Soup Base. There are some (like you Julie) who choose to add QV Pho Soup Base to their made-from-scratch-with-bones broth to further enhance flavors. The important thing to understand is you are now creating a third recipe that combines ingredients from 2 original recipes. And once you start doing this, there are a number of things that will also need to be adjusted, including amount of water, rock sugar, fish sauce, spices, etc. In essence the formula/recipe is changed. If you haven’t already done so, I think you should write down “Julie’s pho recipe” so that you can consistently reproduce it in the future, or further improve on it. It is true that bone marrow produces a lot of fat, but also as Jaden’s noted, if you let it sit to cool then you can crack and remove the fat “shell” on top of the broth. We all know fat and water don’t mix, and fat always float to the top. If you’re worried about clear broth, then parboiling and simmering stages would take care of that issue for you (if done right). I should add an important note here: When you store the broth at room temperature, in the fridge or in the freezer, the fat layer on top actually protects the broth from interacting with the air. This layer acts to preserve the broth from going bad too soon and prevent if from becoming darker in color over time. So the fatty/marrowy top layer gives you many benefits aside from the fact that it makes your pho super delicious. In the end, if you’re already simmering the bones for 3 hours, then I think you can skip the soup base and go all from scratch (as per Jaden’s recipe), and get awesome pho broth with less money out of pocket. Or if you decide to go through all the simmering AND also add QV Pho Soup Base, then you’ll want to add more water to achieve the proper taste. The net effect of the latter is you get a larger yield, thus more pho broth for the same amount of time spent cooking. Awesome right? Actually this is exactly what some pho restaurants do every day. It’s a long reply so it’s time for me to stop. Happy pho cooking and eating! Damn! Who could eat such a god awful thing? Did you look at the ingredients? disodium guanylate, disodium inosinate are the two that always go with MSG hidden under the misnomer Yeast extract. There’s no quick short cut for bone broth. Those chemicals are every where in all of the “packaged spices” nowadays no wonder every thing tastes the same. @TUAN TRAN: Thanks for sharing your views. People have a choice to 1) cook everything fresh from scratch or 2) “cheat” a little bit using some or all pre-made (processed) food ingredients for the sake of convenience and time saving. Also they can 3) stay home to cook and eat, or 4) go out to enjoy restaurant food; all the time or once in a while. Regardless of what combination of 1), 2), 3), 4) one wants to do, it’s been recommended by many including myself to regulate what you use and what you eat. Not sure if your statement about “no wonder every thing tastes the same” refers to other food or just this particular QV product. It seems an exaggeration and blanket statement to me. Care to elaborate? @CUONG Everything tastes the same meaning because they all use the same chemicals to add “favors” to all different dishes thus the underlying “favor” profile of whatever the dish is is those chemicals. MSG, disodium guanylate, disodium inosinate give the same taste no matter whether you use beef, chicken, pork, etc… That’s the problem with those favor “enhancers.” They don’t enhance anything. They take over, overpower and overwhelm what is supposed to be the main favor of the dish. An analogy is that food is like music and MSG, disodium guanylate, disodium inosinate are like “Ice Ice Baby” bass beat. You don’t listen to Rachmaninoff piano concerto no 3 with Ice Ice Baby bass beat in the back ground, do you? @TUAN TRAN: I think you’re missing the point of using any flavor enhancer, such as MSG and various others. With respect to things like MSG, it doesn’t add new flavors. It merely enhances the flavors that are already there. This means if one uses MSG in a chicken dish, for example, it will not begin to taste like “everything else” as you seem to believe for some reason. It would taste like great chicken to a lot of people if done right and done properly (the reason why they continue going to restaurants). On the other hand, to others or when not done right, it would taste bad or take over, or overpower or overwhelm or whatever you think is the problem. I’m not here to advocate QV products as the best or must-have food. 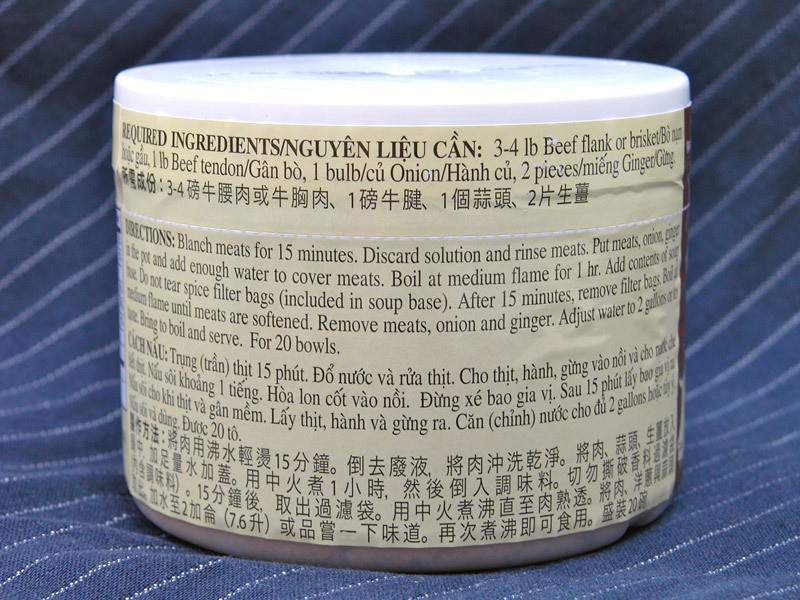 As indicated in the beginning of the post, I said “for those who want to take a shortcut and shave off a few hours, try the Quoc Viet Foods Beef Flavored “Pho” Soup Base option”. One can take advantage of my suggestion to make quicker pho, or one can use a traditional recipe method and spend longer time to make pho too. It’s an individual’s choice. Regardless, I don’t think your music analogy is applicable here. A lot of people like “Ice Ice Baby”, and a lot of other people love Rachmaninoff piano concerto no 3 too. Each is a complete creative work in itself, and as such most people enjoy these complete works as each would stand on its own. I suspect no reasonable person would listen to both at the same time, in the background or otherwise. Now if my neighbor cranks up “Ice Ice Baby” while I’m listening to Rachmaninoff piano concerto no 3 then that’s an entirely different issue. So MSG is just a lowly food ingredient. Use it or not, it’s your choice. As I have always said: know your food and practice moderation. By the way I’m really a Mozart kind of guy, but same the points apply. 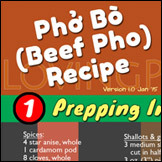 Oh one more thing, I created lovingpho.com to share and exchange knowledge about pho with others. I do appreciate your taking time to share your views. With that said, I will exercise my editorial authority to cut off or remove any conversation that don’t really contribute anything to a healthy pho discussion and knowledge sharing. I agree!!! 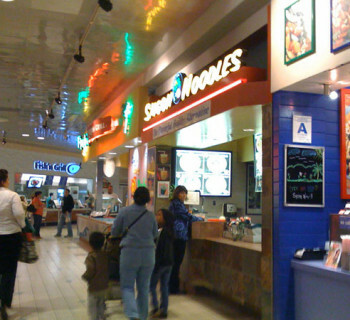 MSG is deceptively hidden in ingredients such as “natural flavorings” “yeast extract” … just google it. Just had a baby, so we’re so much more conscious and aware of what we eat now … if only they made the spices without all those toxic nasties. @AMBER: Wow what a difference a year makes. Last year you loved QV’s soup base, but now its ingredients are “deceptive” and “nasties”. What happens? Hi Cuong! I had a baby (7 months and eating solids) … and now I’m so cognizant of ingredients that go into her body. Hi Amber: Well that’s a perfectly a good reason to pay more attention to ingredients in your food. The best and healthiest meal option has always been home-made with ingredients you pick and cooking method you choose. Best wishes to you and new member of your family.